A new map has been issued by NOAA/NASA. 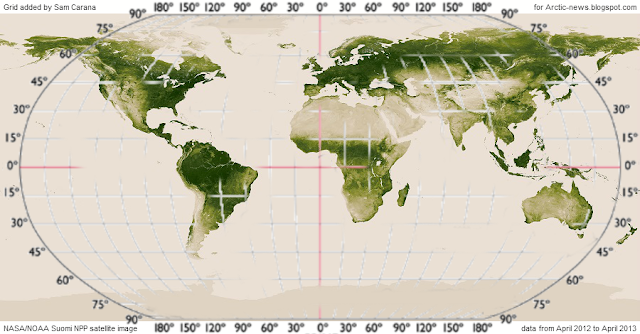 The map shows that most vegetation grows in two bands, i.e. the Tropical Band (between latitudes 15°N and 15°S) and the Northern Band in between 45°N and 75°N, i.e. in North America, Europe and Siberia. On above image, the map is roughly overlayed with a grid to indicate latitude and longitude co-ordinates. 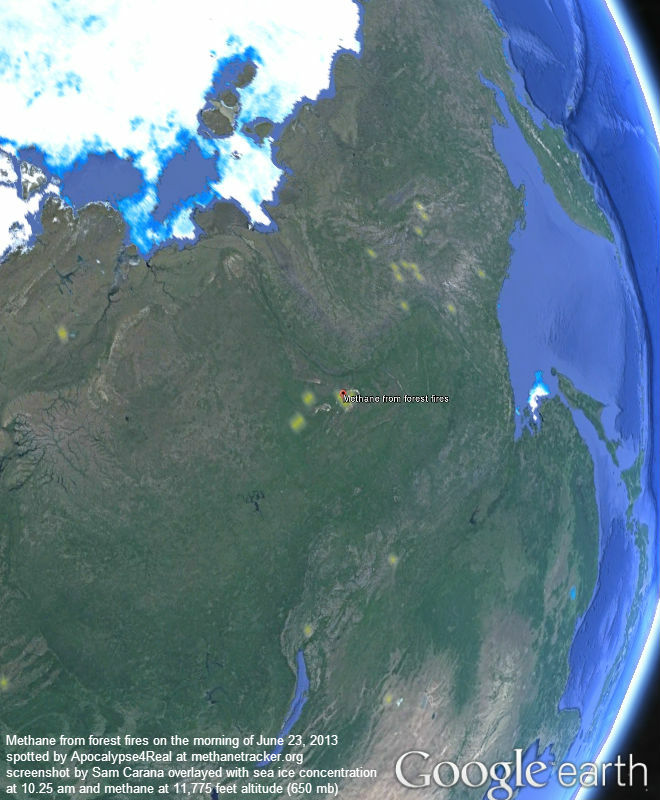 Vegetation in the Northern Band extends beyond the Arctic Circle (latitude 66° 33′ 44″ or 66.5622°, in blue on above image from Arcticsystem.no) into the Arctic, covering sparsely-populated areas such in Siberia, Alaska and the northern parts of Canada and Scandinavia. Further into the Arctic, there are huge areas with bush and shrubland that have taken thousands of years to develop, and once burnt, it can take a long time for vegetation to return, due to the short growing season and harsh conditions in the Arctic. 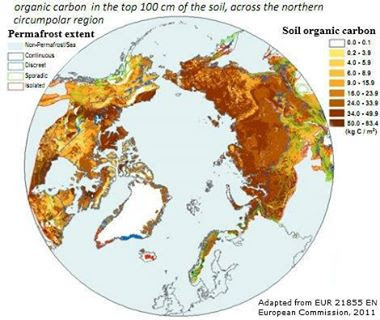 Above map with soil carbon content further shows that the top 100 cm of soil in the northern circumpolar region furthermore contains huge amounts of carbon. Global warming increases the risk of wildfires. This is especially applicable to the Arctic, where temperatures have been rising faster than anywhere else on Earth. Anomalies can be very high in specific cases, as illustrated by the temperature map below. High temperatures and drought combine to increase the threat of wildfires (see above image showing drought severity). 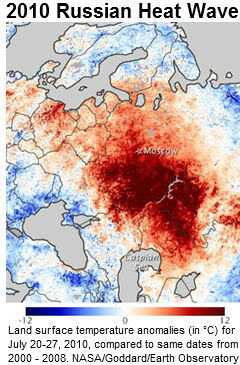 Zyryanka, Siberia, recently recorded a high of 37.4°C (99.3°F), against normal high temperatures of 20°C to 21°C for this time of year. Heat wave conditions were also recorded in Alaska recently, with temperatures as high as 96°F (36°C). 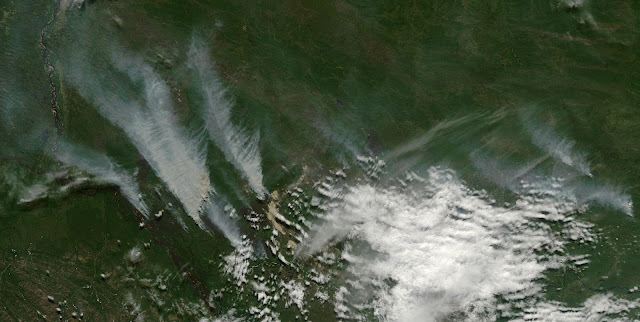 On June 19, 2013, NASA captured this image of smoke from wildfires burning in western Alaska. The smoke was moving west over Norton Sound. (The center of the image is roughly 163° West and 62° North.) Red outlines indicate hot spots with unusually warm surface temperatures associated with fire. NASA image by Jeff Schmaltz, LANCE/EOSDIS Rapid Response. Caption by Adam Voiland. - also see this post with NASA satellite image of Alaska. 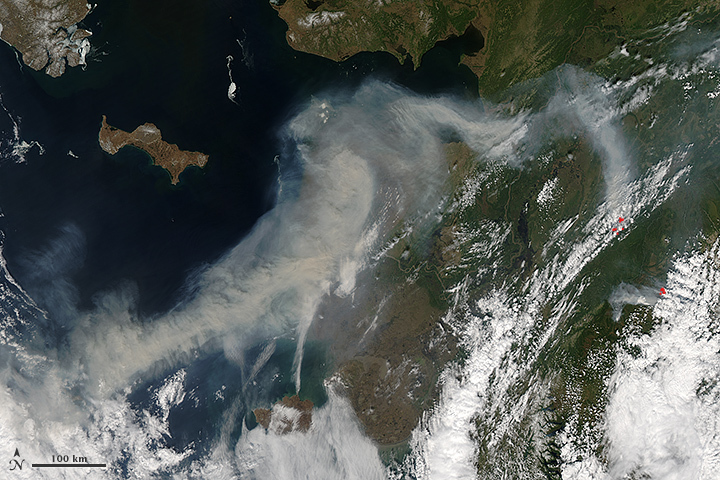 Wildfires raged in Russia in 2010. 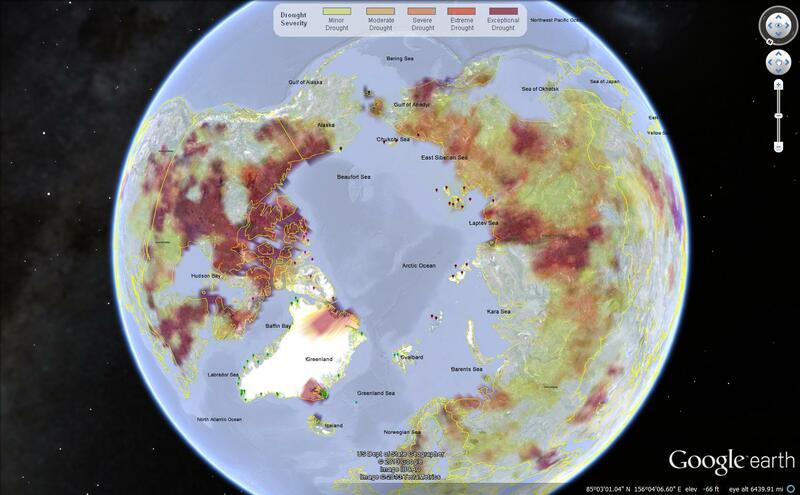 Flames ravaged 1.25 million hectares (4,826 mi²) of land including 2,092 hectares of peat moor. Damage from the fires is estimated to be $15 billion, in a report in the Guardian. Cost of fire-fighting efforts and agricultural losses alone are estimated at over $2bn, reports Munich Re, adding that Moscow's inhabitants suffered under a dense cloud of smoke which enveloped the city. In addition to toxic gases, it also contained considerable amounts of particulate matter. Mortality increased significantly: the number of deaths in July and August was 56,000 higher than in the same months in 2009. Wildfires in the North threaten to cause large emissions of greenhouse gases and soot, which can settle on snow and ice in the Arctic and the Himalayan Plateau, with the resulting albedo changes causing a lot more sunlight to be absorbed, instead of reflected as was the case earlier. This in turn adds to the problem. 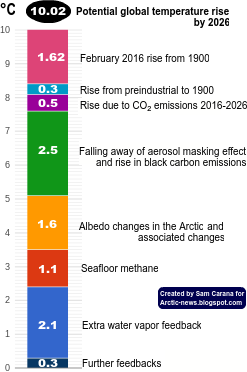 Additionally, rising temperatures in the Arctic threaten to cause release of huge amounts of methane from sediments below the Arctic Ocean. This situation threatens to escalate into runway global warming in a matter of years, as illustrated by the image below. How much will temperatures rise? In conclusion, the risk is unacceptable and calls for a comprehensive and effective action plan that executes multiple lines of action in parallel, such as the 3-part Climate Action Plan below. Part 1 calls for a sustainable economy, i.e. 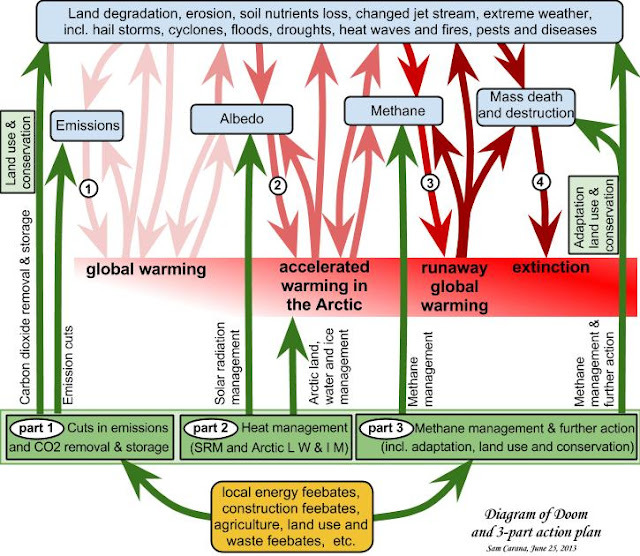 dramatic reductions of pollutants on land, in oceans and in the atmosphere. Part 2 calls for heat management. 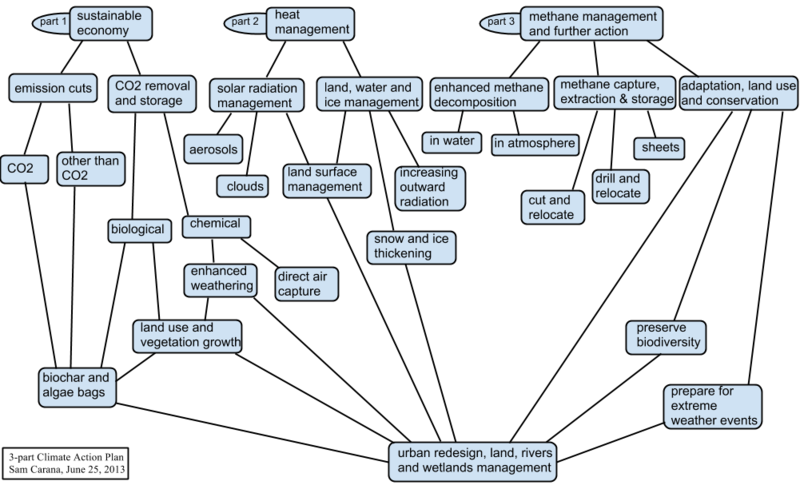 Part 3 calls for methane management and further measures. The Climate Action Plan set out in above diagram can be initiated immediately in any country, without the need for an international agreement to be reached first. This can avoid delays associated with complicated negotiations and on-going verification of implementation and progress in other nations. The President directs federal departments and agencies to reduce their emissions for each type of pollutant annually by a set percentage, say, CO2 and CH4 by 10%, and HFCs, N2O and soot by higher percentages. The President demands states to each make the same cuts. The President directs the federal Environmental Protection Agency (EPA) to monitor implementation of states and to act step in where a state looks set to fail to miss one or more targets, by imposing (federal) fees on applicable polluting products sold in the respective state, with revenues used for federal benefits. Such federal benefits could include building interstate High-Speed Rail tracks, adaptation and conservation measures, management of national parks, R&D into batteries, ways to vegetate deserts and other land use measurements, all at the discretion of the EPA. The fees can be roughly calculated as the average of fees that other states impose in successful efforts to meet their targets. This way, the decision how to reduce targets is largely delegated to state level, while states can similarly delegate decisions to local communities. While feebates, preferably implemented locally, are recommended as the most effective way to reach targets, each state and even each local community can largely decide how to implement things, provided that each of the targets are reached. Similar targets could be adopted elsewhere in the world, and each nation could similarly delegate responsibilities to local communities. 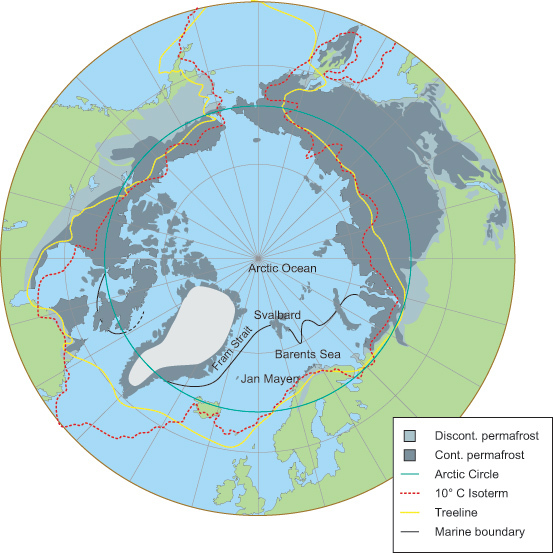 Additionally, it makes sense to agree internationally to impose extra fees on international commercial aviation, with revenues used to develop ways to cool the Arctic. The human enterprise system at large today is driven by money not tied to its benefit through use to the purpose of keeping Earth alive with open ecosystems viable. This means the block diagram is only even vaguely doable to stop Runaway, reverse Runaway if an alteration is made to standing law of contract basis and monetary evaluation; Sea change. Preconditions of Peace, Trust, Caring for Others. But mankind is not driven by Logic even to same purpose as trying at this late date to create magic of the benefit of the world working together for common purpose in Peace..
because if we don't take ambition what good God? Hey Dale! Thanks for turning me onto this site. I'm about to post the March Against Monsanto video (Boulder Vidcast). Runaway Global Warming,, scary! The Today's High Temperature map does not actually show the day's high temperatures for everywhere on the map. The high in Austin, Texas June 25 was 100 F, not the around 80 F shown. Some of these fires are in peat beds that go down 10 feet or more. These are very difficult fires to put out, especially East of Moscow. Some could take years to burn out on their own. I'm just starting to write support information for methanetracker.org. Even though the written explanation for each data layer is still in the works, I thought it could be helpful to your audience to mention that the data layers of the bands 7 2 1 (in Data Layers, under "Corrected and Surface Reflectance" will specifically display vegetation and burn scars, with vegetation being a bright green and burn scars being brown, burnt orange or red; and you can overlay the methane on top of it. Every time you see a burn scar you'll see methane hovering on top. I was showing the data layer Terra Land Surface Reflectance (Bands 7-2-1) to a friend yesterday, and it was incredible how many under-reported fires are there. If you see methane released over areas with vegetation and you fly under the methane, often you'll see burnt orange, brown or red right underneath. Thanks Omar, the use of infrared light in "band 7-2-1" is also well visible in the bottom photo of Australian Wildfires, September 18, 2012. I can see that this can be very useful. Things around the world are linked and the environment on whole is in dire shape including the South Pacific Island community. They are meeting combining Climate with Disaster preparedness today and in follow up to round table climate summit. Fire in the North releasing Methane goes into veil around Earth same as Fire in Australian outback does. And heat increase affects the price of food and sea levels for Pacific Island Nations. Here is what I just posted on line at Pacific Scoop, NZ. Cross Posted as said. this. As I write this. Sam who runs the site I refer to has action plan put forward. my opinion to get the systemic change needed at root core..
humans and Nature' open systems that sustain us integrally. where it will fall when Runaway global warming plays out. Runaway of Class M Planet. -Let's not go there. Please. 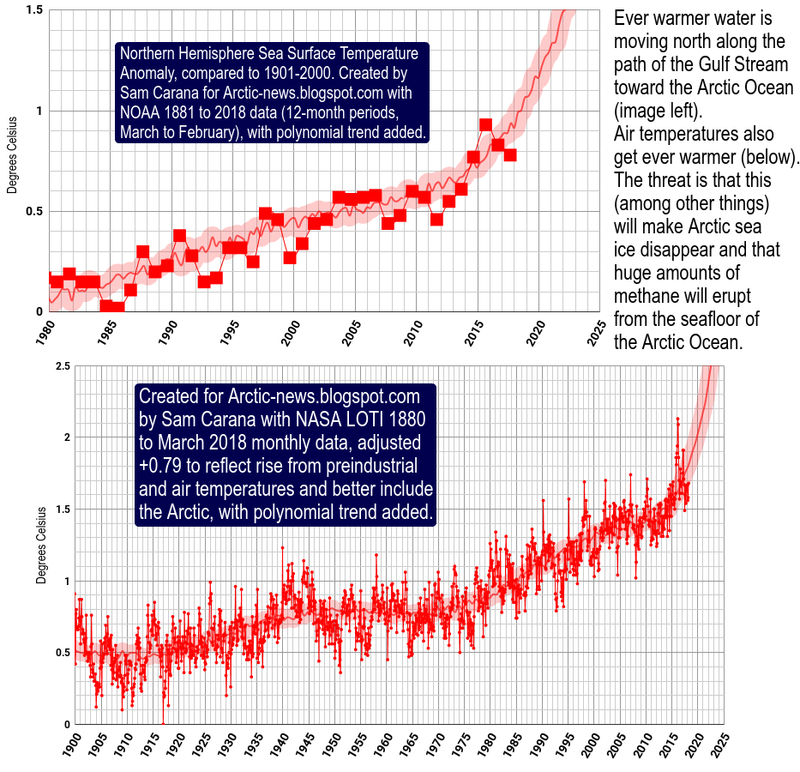 -Cross posting to Arctic News from longhand copy.. 2C"